Some thoughts on alignment in belief space. A nagging question for me is why phase locking, a naturally occurring phenomenon, was selected for to produce collective intelligence instead of something else. My intuition is that building communities using rules of physical and cognitive alignment takes advantage of randomness to produce a good balance of explore/exploit behaviors in the population. Flocking depends on the ability to align, based on a relationship with neighbors. The ease of alignment is proportional to two things (I think). A low number of dimensions. The fewer the dimensions, the easier the alignment. It is easier to get a herd of cattle to stampede in a slot canyon than an open field. This is the fundamental piece. A contributing factor to the type of collective behavior is the turning rate with respect to velocity. The easier it is to turn, the easier it is to flock. It’s no accident that starlings, a small, nimble bird, can produce murmurations. Larger birds, such as geese, have much less dynamic formations. This applies to belief space as well. It is easier for people to agree when a concept is simplified. Similarly, the pattern of consensus will reflect the groups’ overall acceptance or resistance to change. I think this is a critical difference between a progressive and a reactionary. I’m going to assume that like in most populations, these qualities have a normal distribution. There will be a majority that have very common dimension perception, velocity, and turning rates. There will also be individuals at either tail of the population. At one end, there will be those who see the world very simply. At the other, there will be those who see complexity where the majority don’t. At one end, there will be those who cannot adapt to any change. At the other, there will be those who hold no fixed opinion on anything. Flocking depends, on alignment. But the individuals at the extremes will have difficulty staying with the relative safety of the flock. This means that there will be selection pressures. Those individuals who oversimplify and are unable to change direction should be selected against. When it’s more important to attend to your neighbors that find food, things don’t end well. What happens at the other end? There is one tail of this population that produces nimble individuals that perceive a greater complexity in the world. They also have difficulty staying with the flock, because their patterns of behavior are influenced by things that they perceive that the rest of the flock does not. In cooperative game theory, this ‘noticing too much’ disrupts the common frames (alignment) that groups use to make implicit decisions (page 14). I believe that these individuals become explorers. Explorers are also selected against, but not as much. The additional perception provides a better understanding of potential threats. Nimbleness helps to prevent getting caught. These explores provide an extended footprint for the population, which means greater resilience if the primary population encounters problems. A population can rebuild from an explorer diaspora. Initially, the population will consist of too many explorers, and will have poor collective behaviors, but over time, selection pressures will push the mean so that there is sufficient alignment for flocking, but not so much that there is regular stampeding. Since it is always computationally more efficient to align tightly with a population that is moving in the right direction (it’s copying your answers from your classmates), there will always be pressure to move towards stampedes. The resiliency offered by nomadic exploration is a long term investment that does not have a short term payoff. The compromise of flocking gives most of the benefits of either extreme, but it is a saddle point, always under the threat of unanticipated externalities. When intelligent machines come, they will not be tuned by millions of years of evolution to be resilient, to have all those non-optimal behaviors that “even the odds”, should something unforeseen happen. At least initially, they will be constructed to provide the highest possible return on investment. And, like high-frequency trading systems, stampedes, in the form of bubbles and crashes will happen. We need to understand this phenomena much more thoroughly, and begin to incorporate concepts like diversity and limited social influence horizons into our designs. This entry was posted in Article, Information space on January 10, 2018 by pgfeldman. Journal: Evolutionary Ecology: Evolutionary Ecology is a conceptually oriented journal of basic biology at the interface of ecology and evolution. The journal publishes original research, reviews and discussion papers dealing with evolutionary ecology, including evolutionary aspects of behavioral and population ecology. The objective is to promote the conceptual, theoretical and empirical development of ecology and evolutionary biology; the scope extends to all organisms and systems. Research papers present the results of empirical and theoretical investigations, testing current theories in evolutionary ecology. Author: Daniel Grunbaum: My research program seeks to establish quantitative relationships between short-term, small-scale processes, such as individual movement behaviors, and their long-term, large-scale population level effects, such as population fluxes and distributions. This entry was posted in Bubbles and AntiBubbles, Information space, Papers on December 11, 2017 by pgfeldman. Journal: Consciousness and Cognition, an International Journal, provides a forum for a natural science approach to the issues of consciousness, voluntary control, and self. The journal features empirical research (in the form of articles) and theoretical reviews. The journal aims to be both scientifically rigorous and open to novel contributions. Mattia Gallotti (Scholar): Manager of The Human Mind Project at the School of Advanced Study of the University of London. I have a keen interest in academic management and governance, and I now consult on aspects of social innovation in the public sector. Merle Theresa Fairhurst-Menuhin: Merle is equally driven by a passion for art and science. Her days are split between work in cognitive neuroscience and exploring the rich repertoire of art song. Chris Frith (Scholar): I have been trying to delineate the mechanisms underlying the human ability to share representations of the world, for it is this ability that makes communication possible and allows us to achieve more than we could as individuals. We think that there are two major processes involved. The first is an automatic form of priming (sometimes referred to as contagion or empathy), whereby our representations of the world become aligned with those of the person with whom we are interacting. The second is a form of forward modelling, analogous to that used in the control of our own actions. This entry was posted in Information space, Papers on December 5, 2017 by pgfeldman. 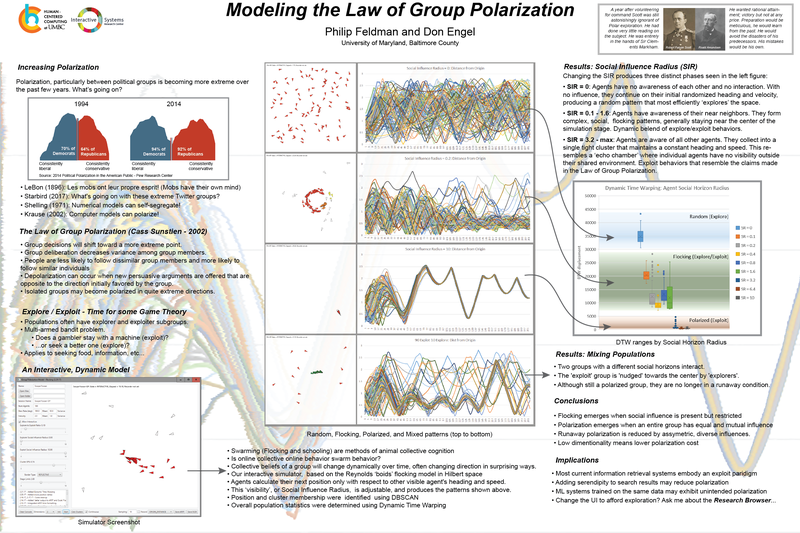 Over the past year, I’ve been building a model that lets me look at how opinions evolve in belief space, much in the manner that flocks, herds and schools emerge in the wild. Presenter Ed Butler hears a range of voices raising concern about the existential threat that social media could pose to democracy, including Ukrainian government official Dmytro Shymkiv, journalist Berit Anderson, tech investor Roger McNamee and internet pioneer Larry Smarr. Roger McNamee and Larry Smarr in particular note how social media can be used to increase polarization based on emergent poles. In other words, “normal” opposing views can be amplified by attentive bad actors [page 24] with an eye towards causing generalized societal disruption. 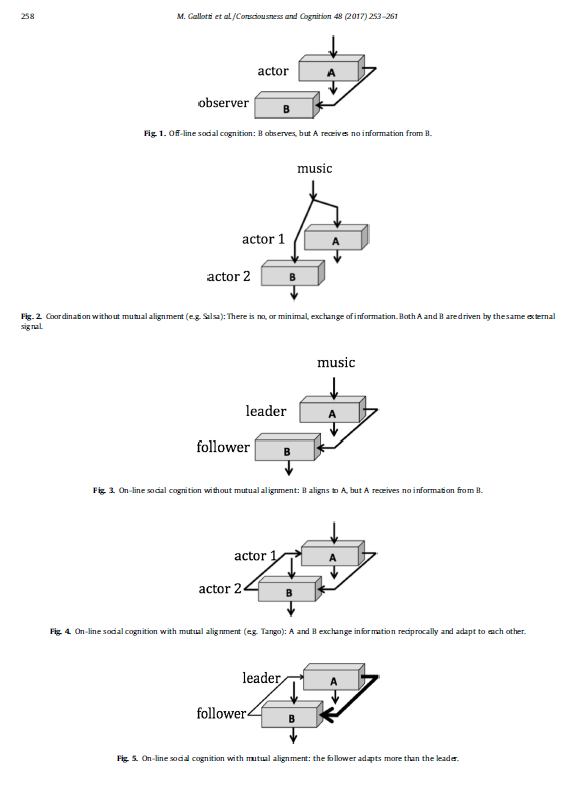 My model explores emergent group interactions and I wondered if this adversarial herding in information space as it might work in my model. Herders appear like multiple individuals that may seem close and trustworthy, but they are actually a distant monolithic entity that is aware of a much larger belief space. When in ‘herding mode’ the overall heading of the population is calculated, and the agent that is closest to that heading is selected to be amplified by our trolls/bot army. The weight is increased to X, and the radius is increased to Y.
X represents AMPLIFICATION BY trolls, bots, etc. Here’s a screenshot of the running simulation. There is an additional set of controls at the upper left that allow herding to be enables, and the weight of the influence to be set. In this case, the herding weight is 10. Though the screenshot shows one large agent shape, the amplified shape flits from agent to agent, always keeping closest to the average heading. The results are kind of scary. 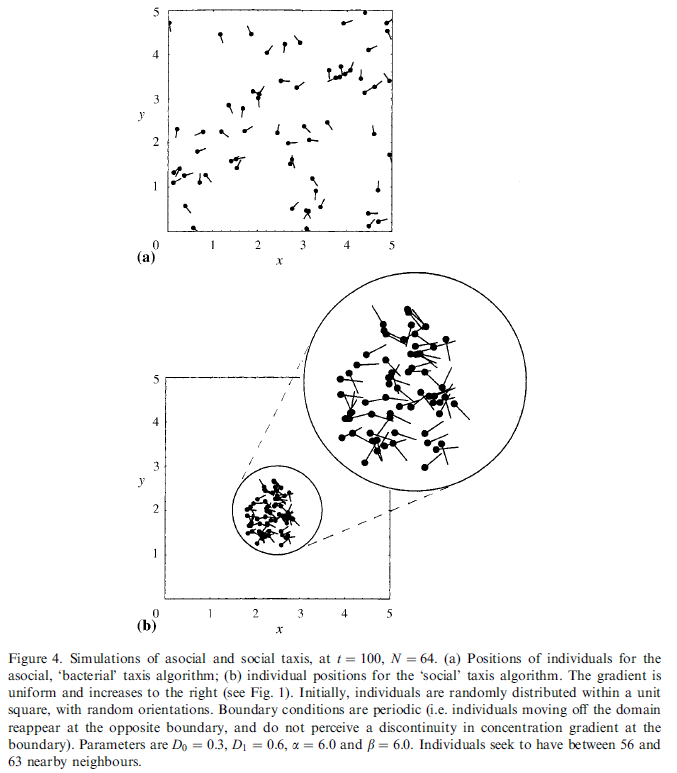 If I set the weight of the herder to 15, I can change the change the flocking behavior of the default to echo chamber. I did some additional tweaking to see if having highly-weighted herders ignore each other (they would be coordinated through C&C) would have any effect. It doesn’t. There is enough interaction through the regular populations to keep the alignment space reduced. It looks like there is a ‘sick echo chamber’ pattern. If the borders are reflective, and the herding weight + influence radius is great enough, then a wall-hugging pattern will emerge. The influence weight is sort of a credibility score. An agent that has a lot of followers, or says a lot of the things that I agree with has a lot of influence weight The range weight is reach. Since a troll farm or botnet can be regarded as a single organization, interacting with any one of the agents is really interacting with the root entity. So a herding agent has high influence and high reach. The high reach explains the border hugging behavior. It’s like there’s someone at the back of the stampede yelling YOUR’E GOING THE RIGHT WAY! KEEP AT IT! And they never go off the cliff because they are a swarm Or, it never goes of the cliff, because it manifests as a swarm. A loud, distributed voice pointing in a bad direction means wall hugging. Note that there is some kind of floating point error that lets wall huggers creep off the edge. Who’d have thought that there could be something worse than runaway polarization? This entry was posted in Article, Bubbles and AntiBubbles, Coding, Information space, Java, Research Notes, Uncategorized on October 27, 2017 by pgfeldman. Awareness refers to how complete the knowledge of an information domain is. Completely aware indicates complete information. Unaware indicates not only absent information but no knowledge of the domain at all. Healthy behaviors emerge when trust and awareness are equivalent. Low trust and low awareness is reasonable. It’s like walking through a dark, unknown space. You go slow, bump into things, and adjust. Low trust and high awareness is paralytic. In the normal case, the two criminals have to evaluate what the best action is based on all the actions the other individual could choose, ideally resulting in a Nash Equilibrium. For two players (p), there are 4 choices (c). However, if each player believes that the other player will make the same choice, then only the two diagonal choices remain. For two players, this reduces the complexity by half. But for multiple dissimilar players, the options go up by cp, so that if this were The Usual Suspects, there would be 32 possibilities to be worked out by each player. But for 5 identical prisoners, the number of choices remains 2, which is basically “what should we all do?”. The more we believe that the others in our social group see the world the same way, the less work we all have to do. Diversity is a mechanism for extending awareness, but it depends on trusting those who are different. That may be the essence of the explore/exploit dilemma. Attention is a form of focused awareness, can reduce general awareness. This is one to the reasons that Tufekci’s thoughts on the attention economy matter so much. As technology increases attention on proportionally more “marketable” items, the population’s social awareness is distorted. In a healthy group context, trust falls off as a function of awareness. That’s why we get flocking. That is the pattern that emerges when you trust more those who are close, while they in turn do the same, building a web of interaction. It’s kind of like interacting ripples? This may work for any collection of entities that have varied states that undergo change in some predictable way. If they were completely random, then awareness of the state is impossible, and trust should be zero. Human agent trust chains might proceed from self to family to friends to community, etc. Genetic agent trust chain is short – self to species. Contact is only for reproduction. Interaction would reflect the very long sampling times. Computer-mediated-communication disturbs this process (as does probably every form of mass communication) because the trust in the system is applied to the trust of the content. This can work in both ways. For example, lowering trust in the press allows for claims of Fake News. Raising the trust of social networks that channel anonymous online sources allows for conspiracy thinking. Since training/learning is spread by update, the installed base is essentially multiple instances of the same individual. So no diversity and very high trust. That’s a recipe for a stampede of 10,000 self driving cars. Since I wrote this, I’ve had some additional thoughts. I think that our understanding of Awareness and Trust is getting confused with Faith and Doubt. Much of what we believe to be true is no longer based on direct evidence, or even an understandable chain of reasoning. Particularly as more and more of our understanding comes from statistical analysis of large sets of fuzzy data, the line between Awareness and Faith becomes blurred, I think. Doubt is an important part of faith, and it has to do with the mind coming up against the unknowable. The question does God exist? contains the basics of the tension between faith and doubt. Proving the existence of God can even be thought of as distraction from the attempt to come to terms with the mysteries of life. Within every one of us is the ability to reject all prior religious thought and start our own journey that aligns with our personal understandings. Conversely, it is impossible to increase awareness without trusting the prior work. Isaac Newton had to trust in large part, the shoulders of the giants he stood on, even if he was refining notions of what gravity was. So too with Albert Einstein, Rosalind Franklin and others in their fields. The scientific method is a framework for building a large, broad-based, interlocking tapestry awareness. When science is approached from a perspective of Faith and Doubt, communities like the Flat Earth Society emerge. It’s based on the faith that the since the world appears flat here, it must be flat everywhere, and doubt of a history of esoteric measurements and math that disprove this personally reasonable assumption. From this perspective, the Flat Earthers are a protestant movement, much in the way that the community that emerged around Martin Luther, when he rejected the organized, carefully constructed orthodoxy of the Catholic Church, based on his personally reasonable interpretation of scripture. Confusing Awareness and Trust with Faith and Doubt is toxic to both. Ongoing, systemic doubt in trustworthy information will destroy progress, ultimately unraveling the tapestry of awareness. Trust that mysteries can be proven is toxic in its own way, since it gives rise to confusion between reality and fantasy like we see in doomsday cults. My sense is that as our ability to manipulate and present information is handed over to machines, that we will need to educate them in these differences, and make sure that they do not become as confused as we are. Because we are rapidly heading for a time where these machines will be co complex and capable that our trust in them will be based on faith. This entry was posted in Article, Bubbles and AntiBubbles, Information space, Misc on October 4, 2017 by pgfeldman.